Go ahead and create a data flow profile as usual through Magento’s admin interface and take note of the profile id (13) in the URL: You will use this profile ID to run the data flow profile via the shell script provided below. In order to execute the script specify the data flow profile id using the –profile switch, e.g. using PHP-CLI. This will run the data flow profile with the ID 13. Save the code below in a file called run_data_flow_profile.php in Magento’s shell folder. Use the command specified above to run the script from within your shell. * Logs $msg to logfile specified in configuration. * Run script based on shell arguments specified. * Retrieve Usage Help Message. The script has been tested with Magento 1.8 and higher. If you happen to find a problem please leave a comment. I have 1.9 version of magento and I tried to run the above code with minor changes as “$ php5-5.4-cli ./run_data_flow_profile.php –profile 13″ is not running in command prompt so I tried”$ php ./run_data_flow_profile.php –profile 13”, but it is not exporting all products from my website. I have this profile to export all my listed products. Help me to solve he problem. If I want to do a dataflow import, where do I mention the import file ( file selection in RUN tab ) ? 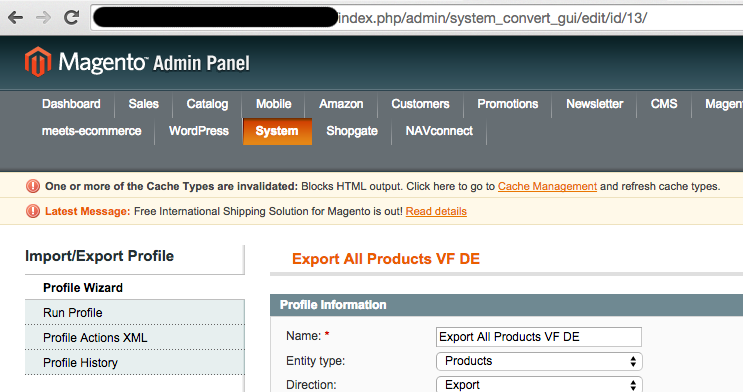 Works like charm to export 22.202 customers from Magento 1.9.2.3. Thanx Man ! The script works well for the dataflow default profile Export Product Stocks, but does not work with the profile Import Product Stocks.